Overnight Saturday Night: Wintry mix after midnight. Lows in the 20s and 30s. Sunday: Early mix, then rain. Highs in the 40s to near 50. Monday: Strong winds, partial clearing. Highs in the 30s and 40s. After a nice start to the weekend, things turn stormy during the second half. 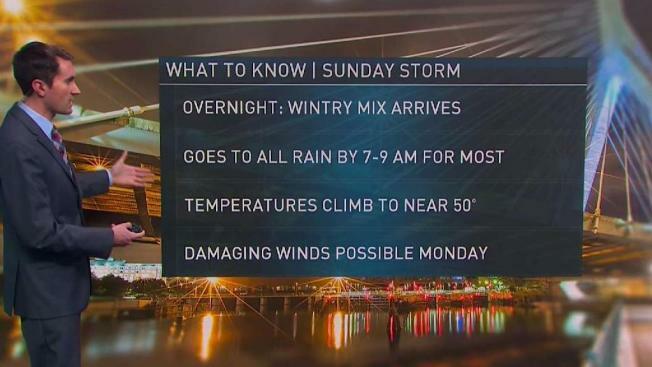 A wintry mix breaks out from southwest to northeast during the very early morning hours of Sunday, creating a few hours of slick travel thanks to sleet and freezing rain from Northern Connecticut into Central Massachusetts, the Merrimack Valley, and parts of Southern New Hampshire. A dusting-1” of sleet and snow will fall in parts of Southern New England, north and west of Boston, with more like 1-3” in parts of Southern New Hampshire. This storm will drag up some warmer air over the course of the day, sending highs into the 40s for many of us, so by afternoon most spots will be seeing rain, with the exception of far Northern New Hampshire and Maine where snow will fall. The storm pulls away on Sunday night, dragging in very strong winds that will keep blowing right through the day on Monday. Expect gusts at times near 50 MPH, resulting in pockets of power outages or some isolated tree damage. The wind will also continue to produce snow in the mountains of Northern and Western New England. When it’s all said and done the mountains of Vermont will see 3-6” of snow, with 6-9” in parts of Northern New Hampshire and Northern Maine. The strong winds will also bring in much colder air by mid-week, with highs only in the 20s. We’ll watch a few disturbances next week, too, in that cold environment, but right now none of them look to be major weather makers for New England.